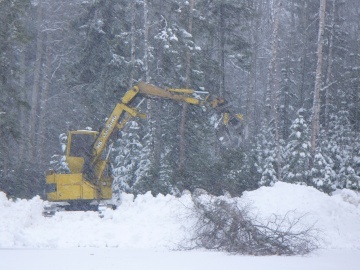 A small loader pulls trees from a stand on the south side of the Northern Sports Centre. Handfalling (chainsaws) and customized machinery are used to ensure a light touch within the natural forests around campus. Beetle-kill and hazard tree removal began this week in priority areas at UNBC’s Prince George Campus. The work will continue for the next few weeks (February 14th to March 4th). If you are on campus please expect periodic traffic delays of up to 10 minutes, while the contractor ensures a safe environment for both the public and the workers. For more information on this project, read the advisory notice and review the campus treatment map. 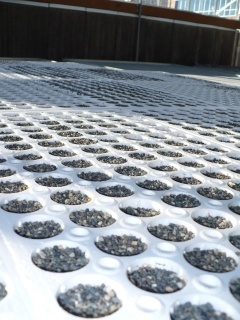 Row upon row of styroblocks are filled with black spruce seeds at the Enhanced Forestry Lab at UNBC. Last year it was western red cedar, this year it’s black spruce. This week staff at UNBC’s IK Barber Enhanced Forestry Lab, sowed over 2000 black spruce seeds for ALRF. When they are ready in 3 months, the seedlings will be planted on wet soils within Block 22 this spring as a demonstration site for species diversity. Stay tuned as we post updates on the seedlings as they grow in the greenhouse! 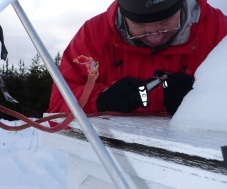 ALRF meteorologist Brendan Murphy repairs the solar panel cable that was chewed through in December. ALRF staff completed an annual winter check on the climate station yesterday, and it was a good thing we did….two cables had been chewed through by ‘something’ (possibly a moose). One cable was for the snowdepth sensor and the other for the solar panel that recharges the station batteries. Based on the data, the station stopped logging snowdepths on December 15th, at 10pm (a late night snack perhaps?). Both cables were repaired, and fortunately, the batteries were still fully charged probably due to the insulating properties of the 135cm of snow at the site!